Here is my entry for this month's one layer simplicity challenge. I first saw the background technique explained in this great video. Since I tried it out I seem to be seeing the technique used everywhere. I can see why. It's fun and gorgeous. 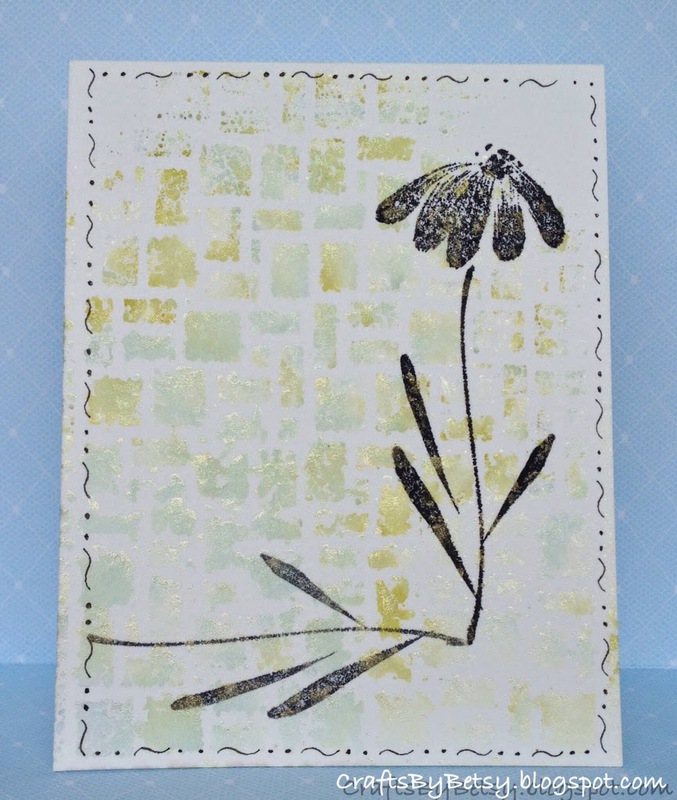 My version uses Brick Wall Pattern by Darice embossing folder with shaded lilac Ranger Distress Ink (yet it came out shades of blue) and lettuce Ranger Adirondack ink that I watered down with Lumin Arte shimmering mist in gold and an added spritz of water for good measure. I was able to get 3 different "prints" from the ink. I let it dry several hours before stamping with Penny Black's Blush with tuxedo black Momento ink by Tsukineko. Luckily I used a stamp positioner as it took 2 or 3 stamps to get it dark enough on the rough watercolor paper. The shadow, also using the stamp positioner using gray flannel Momento, came out darker than I had hoped. I had intended to add a greeting, but in the end I thought it better without it. I did feel the shadow grounded the flower, but then the shadow needed grounding along with the background! So, I decided to draw the border with a Sakura black micron pen. Oh and I should mention, that's one sheet of 4 1/4" x 11 Strathmore Imperial 140 # cold press water color paper, scored and folded in two. I'm beginning to believe that the secret to a good "simple" card is to make it look simple. In truth, it's very difficult, for me at least, to get the design, color, image and placement, all to come out well on one layer. There's not much you can hide!